HomeServe USA (HomeServe), a leading provider of home emergency repair solutions, today announced the launch of its partnership with Evansville Water & Sewer Utility (EWSU) to offer area homeowners optional repair service plans for the water and sewer lines connecting their homes to the EWSU system. This entry was posted in Home Warranty and tagged HomeServe, HomeServe USA on June 27, 2017 by Editor. This entry was posted in Home Warranty and tagged HomeServe on April 28, 2017 by Editor. HomeServe USA (HomeServe), a leading provider of home emergency repair service plans, was presented with 4 Gold, 8 Silver and 4 Bronze Stevie® Awards at the 11thannual Stevie Awards for Sales & Customer Service. This entry was posted in Home Warranty and tagged HomeServe on February 27, 2017 by Editor. Leading provider of home repair solutions, announces winners of its 1st Annual National Top Contractor Awards. 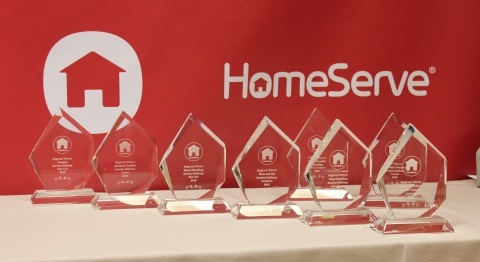 HomeServe recognized contractors from around the U.S. and Canada who are raising the industry bar and achieving excellence in customer service and service delivery. This entry was posted in Home Warranty and tagged HomeServe on October 6, 2016 by Editor. HomeServe Completes Acquisition of Utility Service Partners, Inc.
HomeServe plc, parent company of HomeServe USA (HomeServe), a leading provider of home repair solutions, today announced the successful completion of HomeServe USA’s acquisition of Utility Service Providers, Inc. (USP), also a provider of home repair service plans for North American municipal and utility clients. This entry was posted in Home Warranty and tagged HomeServe on July 1, 2016 by Editor. Startex-Jackson-Wellford-Duncan Water District (SJWD) has announced a partnership with HomeServe USA (HomeServe), a leading provider of home repair solutions, to offer optional home repair service solutions to their more than 20,000 customers. This entry was posted in Home Warranty and tagged HomeServe on June 29, 2016 by Editor. A Keighly-based commercial heating and plumbing firm has launched a new domestic arm focused on helping homeowners across West Yorkshire after joining forced with national home assistance provider HomeServe. This entry was posted in Home Warranty and tagged HomeServe on June 23, 2016 by Editor. HomeServe USA announces that, under its partnership with Aqua America (Aqua), it will be expanding into Aqua’s North Carolina service areas as the utility’s preferred provider of home repair service plans. This entry was posted in Home Warranty and tagged HomeServe on March 21, 2016 by Editor. Reading, PA – June 30, 2015 – HomeServe USA (HomeServe), a leading provider of home repair solutions and turnkey energy-related services, today announced the expansion of the agreement with UGI Penn Natural Gas (UGI PNG) to provide a robust portfolio of optional home repair service plans to UGI PNG customers in northeastern and central Pennsylvania. This entry was posted in Home Warranty and tagged HomeServe on June 30, 2015 by Editor.